Energy expenditure – does it count? No current treatment for obesity reliably sustains weight loss, perhaps because compensatory metabolic processes resist the maintenance of the altered body weight. For some background reading on energy, this might be of interest. 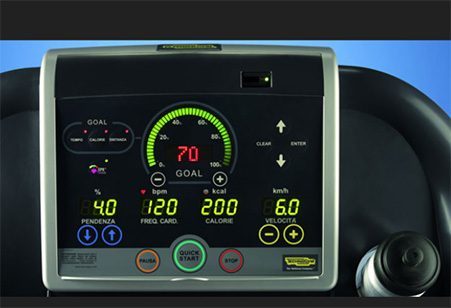 Most endurance exercise apparatus found in a gym are equipped with a calorie counter. By inputting your weight and height and measuring your heart rate the display will tell you how many calories (kilocalories) you’ve burned (Calorie is a measure of energy. The international standard is Joule, but this is largely ignored.). You can literally count the fat loss while exercising. Or can you? Robert W. Jeffery and coworkers randomized 202 obese men and women to standard behavioral therapy with the goal of either expending 1000kcal/week of exercise or 2500kcal/week, for 18 weeks. The actual reported energy expenditure for kilocalories per week at 18 months was 1629 and 2317 for the 1000- and 2500-kcal/week groups, respectively. At 6 months, there were no differences for weight loss between the groups, despite a reported difference in weekly energy expenditure of 562kcal. Reported energy intake was similar between groups. At 18 months the high PA (physical activity) group showed significantly more weight loss than the low PA group, 8.8kg vs 6.7kg. Now that’s a lot of extra exercise for a mere 2kg extra weight lost over 18 months . All participants in the Jeffery study were instructed to reduce daily energy intake to 1000–1500 cal depending on initial body weight and to consume less than 20% of energy as fat. In addition they attended weekly group sessions for 6 months and one session per month thereafter. That is a lot of effort, exercise and starvation for 7-9kg of weight loss in 1.5years. It should also be mentioned that unlike the low PA group the high PA group were instructed weekly by trained exercise coaches and the participants in the high PA group were given 3$ for each week that they achieved or exceeded the energy expenditure goal of 2500 kcal/wk during the last 6 months of active intervention. Imagine the cost of treating overweight this way. The authors of course concluded that when it comes to weight loss, more exercise is better and Donnelly  uses the study to conclude similarly – more is indeed better. However the study shows how there is little association between the amount of energy spent and consequent weight loss. Many studies have showed that adding exercise to an energy restricted diet does not cause a greater weight loss [4-6] . If you are still a believer in the energy in energy out dogma this should have you worried. The truth is that expending more energy often does not lead to greater weight loss. Leanne M. Redman  reported that one study  showed an 80% increased weight loss with exercise. Participants in the study were put on a National Cholesterol Education Program (NCEP) diet or the same diet with exercise (brisk walking or jogging 3 times a week). What Redman forgot to mention was that the exercise group also reported a 550 kJ/day smaller energy intake compared to the diet group. McTiernan and co workers  randomized 202 men and women (sedentary/unfit persons, 40 to 75 years old) to control or an exercise intervention for 12 months. The exercise intervention was facility- and home-based moderate-to-vigorous intensity aerobic activity, 60 min per day, 6 days per week. Mean exercise time was 370 min per week for men and 295min per week for women. At 12 months exercise had resulted in 1.9kg and 3kg reduction in fat mass in women and men respectively. As mentioned in my previous post, it is difficult to account for all the variables in a study. Although the participants were asked not to change their diet, the researcher has only poor data on the participants’ diet. You might argue that the above study shows positive results, showing how exercise effectively reduces weight and hinders weight gain. However, exercising for 60min per day for an entire year only to lose 3kg of fat, do not strike me as great results. Clearly the energy expended through exercise should have resulted in a larger weight loss according to the leading energy in – energy out dogma. Joseph A. Houmard  and colleagues randomized 154 sedentary, overweight/obese subjects to either control or an exercise group for 6 months: 1) low-volume/moderate intensity group [~12 miles walking/week at 40–55% peak O2 consumption], 2) low-volume/high-intensity group (~12 miles jogging/week at 65–80% VO2 peak), and 3) high-volume/high-intensity group (~20 miles jogging/wk at 65–80% VO2 peak). At six months the low-volume/moderate intensity group had lost 0.8kg of body mass. The low-volume/high-intensity group lost 0,6kg of body mass, while the high-volume/high-intensity group which expended the most energy exercising, lost a whopping 1,8kg of body mass. The fairies in the back of my garden were thrilled. Back to Leanne M. Redman at Pennington Biomedical Research Center. Although she is convinced that the human body can be considered equal to a closed system where energy in and energy out is easy to measure and control and is the only thing worth measuring, she has done some very fine research. With her colleagues she did a study where 36 overweight, but otherwise healthy people were randomized to either control (healthy weight maintenance diet), caloric restriction (25% reduction in energy intake), or calorie restriction plus exercise (12.5% reduction in energy intake and 12.5% increase in exercise energy expenditure) for 6 months. After three months weight had declined by 7.4% for calorie restriction only and 5.8% for calorie restriction plus exercise. At six months the numbers were 10.4% and 10.1%, respectively. So the weight loss was equal using two different strategies and calculated energy deficit was equal. However, for men in the diet group fat loss accounted for roughly 64% of the weight lost and 68% in the exercise group. For women, fat loss accounted for 75% of total weight lost in the diet group and 85% in the exercise group. There was a substantial loss of non fat tissue regardless of method, but the loss of different tissues also indicates different amounts of energy lost. In 2002, Jeff Volek and co workers  put 12 overweight women and 10 overweight men on a low fat/low calorie diet and made them exercise four to five times a week. The goal was to reduce weight by 5kg in eight weeks. The women in the trial lost 4.3+3.4kg. But only 58% of this was fat mass. Percentage body fat went from 44.2 to 43.2. After eight weeks the women were just as fat. Had all the weight lost been fat, body fat percentage would have dropped to 41.8 – a much more reasonable drop. Imagine these women losing weight like this outside of a study setting, eating less and exercising – perhaps watching the calorie counter on the treadmill. They would probably have been thrilled to lose 0.5kg of weight each week. Robert Ross  randomized 52 obese men to control, weight loss by diet alone, weight loss by exercise alone or exercise with stable body weight. Participants in the diet-induced weight loss group were asked to reduce daily intake by 700kcal during the treatment period to achieve a weekly weight loss of approximately 0.6kg. To lose the same amount of weight, participants in the exercise-induced weight loss group were asked to maintain a pre study isocaloric diet for the duration of the treatment period and to perform exercise that expended 700 kcal/d. Participants assigned to exercise without weight loss were asked to maintain body weight and to consume enough calories to compensate for the 700 kcal of energy expended during the daily exercise sessions. The average weight loss was similar for both the diet-induced weight loss group (7.4 kg) and the exercise-induced weight loss group (7.6 kg). And the caveat? Calculated daily energy deficit (Doubly Labeled Water 14 Days during Weeks 6 to 7) was -663kcal in the diet group and -1039kcal in the exercise group. And although the participants in the exercise group were to not change their diet, they were instructed to follow official dietary guidelines. In addition the total fat loss in the diet group was 4.8kg and 6.1kg in the exercise group. I could go on showing exercise studies that does not support the view that energy expenditure and intake is something we can control and should base exercise on – that we can calculate fat lost by exercise. Weight loss is vastly different between studies that are aiming for similar energy deficits. It is likely that the type of exercise is a confounding factor, as well as individual differences and lots of other hard to control for variables. My point is, if researchers struggle this hard to calculate fat loss and to use energy expenditure and intake as guidelines in weight loss, how is regular Joe to cope with the same task? Meaning that, exercise is good for you, even though you probably won’t lose any weight. In “A dose-response relation between aerobic exercise and visceral fat reduction: systematic review of clinical trials,” Ohkawara  and co workers found that there is a correlation between visceral fat loss and amount of energy expended exercising. But, the correlation was only present in subgroup analyses and nonexistent if people with metabolic-related disorders were included. Once again those with metabolic dysfunction ruin the perfect stats, and once again it seems that in those that need it the most, exercise don’t yield the expected results. Robert Ross also did a dose-response review, in 2001. He found a dose response relationship between exercise and weight loss only in short term studies (less than 26 weeks), and not in long term studies . Although there is a positive dose response correlation between exercise and weight loss (fat loss) in subgroups of people we still cannot assume that the correlation exists because more energy expended causes more weight loss. Exercise may cause a shift in the metabolism that make us less hungry and make us compensate less for the energy expended. The effect may also be unrelated to the amount of energy expended. As mentioned, there are a lot of variables at play here. Often when energy expenditure is upped it is through higher intensity exercise. Any difference between low and high energy expenditure might just as well be because of different intensities. You will have a difficult time finding solid data showing a strong correlation between energy expended during exercise and consequent fat loss. More exercise and more energy demanding exercise does not necessarily give better long term results. (it often does not) Because of this, when we want to find the exercise type that is best for weight loss, we should base our decision on factors other than energy expenditure. The question is what factors? 1. Leibel RL, Rosenbaum M, Hirsch J: Changes in energy expenditure resulting from altered body weight. N Engl J Med 1995, 332: 621-628. 2. Jeffery RW, Wing RR, Sherwood NE, Tate DF: Physical activity and weight loss: does prescribing higher physical activity goals improve outcome? Am J Clin Nutr 2003, 78: 684-689. 4. Nieman DC, Brock DW, Butterworth D, Utter AC, Nieman CC: Reducing diet and/or exercise training decreases the lipid and lipoprotein risk factors of moderately obese women. J Am Coll Nutr 2002, 21: 344-350. 5. Cox KL, Burke V, Morton AR, Beilin LJ, Puddey IB: The independent and combined effects of 16 weeks of vigorous exercise and energy restriction on body mass and composition in free-living overweight men–a randomized controlled trial. Metabolism 2003, 52: 107-115. 6. Dengel DR, Galecki AT, Hagberg JM, Pratley RE: The independent and combined effects of weight loss and aerobic exercise on blood pressure and oral glucose tolerance in older men. Am J Hypertens 1998, 11: 1405-1412. 7. Redman LM, Heilbronn LK, Martin CK, Alfonso A, Smith SR, Ravussin E: Effect of calorie restriction with or without exercise on body composition and fat distribution. J Clin Endocrinol Metab 2007, 92: 865-872. 8. Wood PD, Stefanick ML, Williams PT, Haskell WL: The effects on plasma lipoproteins of a prudent weight-reducing diet, with or without exercise, in overweight men and women. N Engl J Med 1991, 325: 461-466. 9. McTiernan A, Sorensen B, Irwin ML, Morgan A, Yasui Y, Rudolph RE, Surawicz C, Lampe JW, Lampe PD, Ayub K, Potter JD: Exercise effect on weight and body fat in men and women. Obesity (Silver Spring) 2007, 15: 1496-1512. 10. Houmard JA, Tanner CJ, Slentz CA, Duscha BD, McCartney JS, Kraus WE: Effect of the volume and intensity of exercise training on insulin sensitivity. J Appl Physiol 2004, 96: 101-106. 11. Volek JS, Gomez AL, Love DM, Weyers AM, Hesslink R, Jr., Wise JA, Kraemer WJ: Effects of an 8-week weight-loss program on cardiovascular disease risk factors and regional body composition. Eur J Clin Nutr 2002, 56: 585-592. 12. Ross R, Dagnone D, Jones PJ, Smith H, Paddags A, Hudson R, Janssen I: Reduction in obesity and related comorbid conditions after diet-induced weight loss or exercise-induced weight loss in men. A randomized, controlled trial. Ann Intern Med 2000, 133: 92-103. 13. Ohkawara K, Tanaka S, Miyachi M, Ishikawa-Takata K, Tabata I: A dose-response relation between aerobic exercise and visceral fat reduction: systematic review of clinical trials. Int J Obes (Lond) 2007, 31: 1786-1797. 14. Ross R, Janssen I: Physical activity, total and regional obesity: dose-response considerations. Med Sci Sports Exerc 2001, 33: S521-S527. 15. Melzer K, Kayser B, Saris WH, Pichard C: Effects of physical activity on food intake. Clin Nutr 2005, 24: 885-895. No really I think they look like a mans legs although somewhat feminine man legs. What`s your best advice on how to get a six pack. I have been eating very little carbs for 18 months now, and a lot of fat, mostly saturated, maybe 3-400 g pr day, plus some unsaturated. I have a strong belly, but there i still this 2 pounds of fat there. The best way: A few, very heavy sit ups, with weights, or 1000 easy non-weights every day? I also run a lot, 60 miles or more per week. When i say very litle carbs, i am talking about 20-35 g pr day. But the belly fat reamins. Annoying…. I must admit I have little experience with helping people getting a defined six pack but I think there are a few important things to consider. Diet is perhaps the most important factor to address. We know abdominal visceral fat correlates with inflammation and insulin resistance. I would recommend everybody trying to get a six pack to cut carbs and grains and probably having a good omega 3 to 6 ratio. As it seems you have already done this, I would look more closely at other factors. Stress seems to cause a preferential storing of fat in the abdominal region. Relaxing and making sure to have days of restitution between exercises is a good idea. I suspect, although I don’t think I’ve seen any data on it, that a lot of endurance exercise also can be a strong stressor and might thus case storage of fat on the abdomen. I do not think I have ever seen a study showing that the abdominal muscles need different kinds of stimuli than other skeletal muscles to hypertrophy. That means we have to do quite heavy resistance exercises with reps in the area of 5-20 (5-20 repetition maximum) per set. But the better exercised a muscle is the stronger stimuli it needs to grow. In trials of untrained individuals it has been shown that on the upper body 3 sets per exercise does not offer any advantage over one set per exercise. On lower body muscles 3 sets do offer an advantage over 1 set. The reason is likely that leg muscles get much more every day stimuli than the arms so more exercise is needed to grow muscle tissue. I think it might be the same with the abdominal muscles. These are activated a lot during the day so they might need a lot of exercise to grow. I would still only do 5-20 reps per set, but I’d do 1-3 different exercises or at least more than 3 sets of one exercise. Also, I would not exercise the abdomen on two consecutive days. Doing 1000 sit-ups is time not well spent. This is endurance exercise and do not cause much hypertrophy. Sit-up is not a good exercise unless you can increase the resistance well above body weight. Still, the reason most people have a six pack is because of little abdominal fat and not because of large rectus abdominis. Getting to that fat is the most important factor. Carbs, stress factors and any factors that might contribute to inflammation should be considered. Forrige Forrige innlegg: What is the best exercise for fat loss?